Over the past 30 years the U.S. Fish and Wildlife Service (FWS) has used the Endangered Species Act (ESA) to put people out of work and to shut down major industries in the United States in the name of conservation. These shutdowns have hurt families and regional economies, and now the FWS is preparing to do it again in Texas. And this hunting season, their sights are on the Permian Basin and possibly the Eagle Ford in South Texas. The authority for the FWS to shut down industrial commerce comes, ironically, from the much-abused Commerce Clause of the U.S. Constitution where it states: "To regulate Commerce with foreign nations, and among the several states and with the Indian tribes. The key words here are "among the several states." In using the Commerce Clause, the FWS has been given federal authority over local commerce only if it affects interstate commerce. The mission statement of the FWS omits that important qualifier, and it oversteps its constitutional authority when it says "[t]he mission of the U.S. Fish and Wildlife Service is working with others to conserve, protect and enhance fish, wildlife, plants and their habitats for the continuing benefit of the American people." But let's start at the beginning. In the 1980s there was a great controversy over the shrinking habitat of what was then the recently declared endangered species, the Northern Spotted Owl. Under the ESA, a declared endangered species is protected under federal law. The first problem here is that the Northern Spotted Owl is not a species, it is a subspecies; the other variants are the California Spotted Owl and the Mexican Spotted Owl. The differences in genetic variation among these owl types are of no significance. Regardless of this fact the FWS was able to shut down a thriving industry of harvesting timber from old growth forests on privately owned lands by misusing and overstepping the limits of the Commerce Clause. Even if the Northern Spotted Owl crossed state lines, it does not affect interstate commerce, but nonetheless, the federal government and the courts have ignored the unconstitutional application of federal authority. This illegal action resulted in thousands of hard-working middle class Americans in the Pacific Northwest being thrown out of work, and it increased our trade deficit. And no one has ever explained exactly how that action fulfills the mission statement of the Commerce clause where it states, "...for the continuing benefit of the American people." The science used to implement this shutdown is questionable in significant areas. The reality is that one of the principal threats to the so called "species" of the Northern Spotted Owl is not the shrinkage of habitat due to timber harvesting but the inability of the owl to compete with other owl species such as the Barred Owl. This fact was revealed in a recently published report from the FWS entitled the "Northern Spotted Owl, Five Year Review: Summary and Evaluation." This report goes on to document cases of interbreeding with the Barred Owl. This is called "natural selection," but the FWS does not let the scientific facts get in the way of their job-killing agenda. Emboldened by this "success" of raising the value of a sub-species above that of the hard working middle class, the FWS next took aim at California's thriving agriculture industry to kill jobs there. Once zeroed in, the fatal shot was delivered when the FWS declared that the Delta Smelt is an endangered species. The Delta Smelt is a minnow-sized freshwater fish that has no economic value and that does not swim across state lines. Despite these facts, the federal court system seemed to think that the Commerce Clause applied. At the behest of the FWS, a federal court order was issued to shut off the water to the San Joaquin Valley to preserve the fish. This act killed all agriculture in the valley and resulted in a localized unemployment rate of more than 29 percent. Like a serial killer, the FWS is now plotting the fate of its next victim, the oil and gas industry in Texas. Their allies in this unconstitutional action are invasive fire ants and feral hogs. Since the invasion of fire ants in the 1960s, the lizard population in Texas, including the famous horned lizard, has been shrinking. Further reductions in lizard population are attributed to feral hogs uprooting the habitat and eating the lizards. On a side note, Texans are attempting to take charge of the hog invasion through the 82nd Legislature's passage of HB 716, which legalizes aerial hog hunting from a helicopter. This act took effect September 1, 2011. These notable population reductions are not the result of any human activity, but the result of natural selection. Fire ants are very aggressive and possess a potent poison to kill would-be predators, like lizards. The same description applies to feral hogs as they pillage these lizards' habitat. These facts seems to be irrelevant to the FWS, as they consider declaring two lizard species endangered; species that certainly must have lived for decades with the Texas oil and gas industry before the invasive fire ants and feral hogs came. The result of such an action could shut in millions of barrels of oil produced in areas of Texas, putting at risk over 100,000 jobs and driving fuel prices higher at the pump. The lizards in question are the Dunes Sagebrush Lizard and the Spotted Tailed Earless Lizard. The Dunes Sagebrush Lizard has been a candidate for the endangered species list since 2001, and the possibility that the Spotted Tailed Earless Lizard might be placed upon the list arose in May of this year when the FWS issued a press release stating that the decline in the population "may warrant federal protection." In the same press release, they cite fire ants as the cause of the population reduction. These lizards likely do not cross state lines and surely do not affect interstate commerce; e.g., these species do not pollinate flowers nor prey upon crop pests. In short, there is no justification for the application of the federal Commerce Clause. To make matters worse, the science that the FWS uses is suspect. The FWS seems to have only looked at a very sparse data set collected in the 1960s. Since there is so little data in the baseline survey, surveys done in 2006 and 2007 could not definitively determine if the geographic area occupied by either of these species was expanding or contracting. If you look at all of the available data, there are contradictions with FWS data sets. 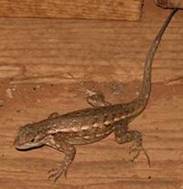 In 2007 the Sagebrush Lizard was considered to be locally extinct at Monahans Sandhills State Park, but a subsequent survey in 2010 found the lizard was still there, alive and well. Here are the facts. Foreign invading species, like feral hogs and fire ants, attack lizards that are confined to Texas and that do not affect interstate commerce. Oil and gas exploration and development, and ranching operations have been ongoing in and around identified habitat area for generations. A federal agency, the U.S. Fish and Wildlife Service, determines that it has the authority, both constitutional and statutory, to use the alleged endangerment of the lizards to potentially halt and certainly hold up oil and gas and other operations in the region. The federal agency drives consumer costs up and depresses good-paying jobs and exacerbates America's deadly reliance on unstable foreign governments for crude oil. This continued assault on job creators and energy providers, by federal agency fiat, knows no limits, but it must be stopped. We must protect the economies and jobs generated in the energy-producing regions like the Permian Basin. The U.S. Constitution starts with "We The People..." not "We The Lizards." The federal government has no authority nor justification for placing the survival of lizards above the lives of the American people, who are just trying to survive themselves. Chairman Elizabeth Ames Jones was overwhelmingly elected to Texas's energy oversight agency, the Railroad Commission, in 2006 after having served two terms in the Texas Legislature. This article was previously published at mywesttexas.com and is reprinted here with the permission of the author, Elizabeth Ames Jones.